Most people spend time at their jobs just working for vacation. They dream up the places they want to visit and save money just in order to spend time away. Wouldn’t it be great if there was a job that actually allowed you to travel while you worked? Thankfully, now more than ever, there are tons of job opportunities available that allow exactly this. 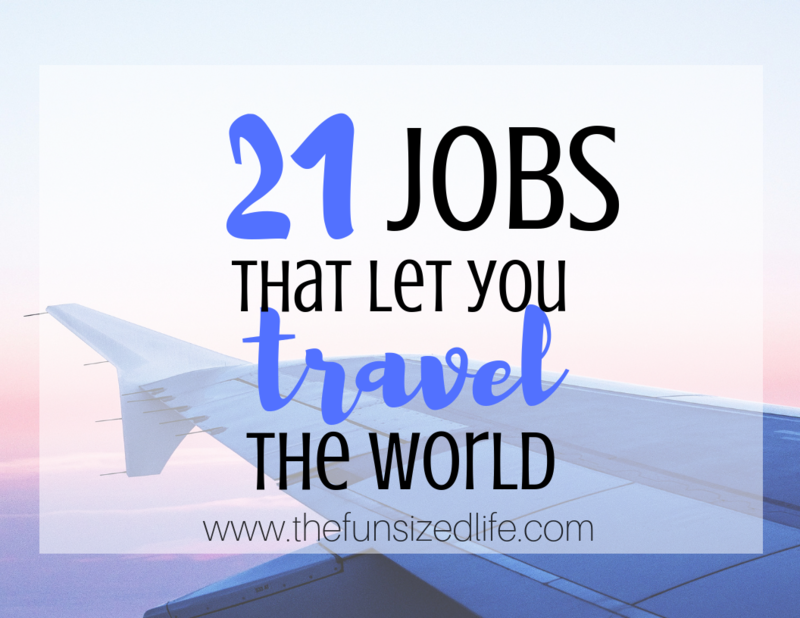 If you spend most of your days dreaming of seeing the world while earning a living, I have compiled a great list of 21 jobs that let you travel the world. See if there is one that sounds perfect for you. *This post contains affiliate links. I may make a commission but all recommendations are my own. Can I get a “WHOOP WHOOP!” I personally started blogging when my husband’s work schedule continuously changed so much that keeping a steady part-time job while homeschooling out kids became nearly impossible. I decided I needed one of the jobs that let you travel and create your own schedule. Because I have always dreamed of traveling for homeschool, I wanted a job that let me do that too. Through blogging, I have made almost triple the amount that I was earning through my previous part-time jobs. While most of that money has gone to paying off our debt, it won’t be long before it really allows us the total financial freedom and ability to travel that we have always dreamed of. Get my full blogging course to see exactly how I made blogging a reality. Right at the top of the list of jobs that let you travel, flight attendant probably comes to your mind. Not only are you given the chance to get paid to travel but you will also receive great benefits as well. It may take a few years and some inconsistent schedules before you are able to really travel the world, but for those who love to travel, it’s worth it. If you are hoping to work your way into this field it is recommended that you start applying at your local airport. Have you ever gone to an all-inclusive resort and there they have yoga, fitness and other instructed classes? That could be you! If you are already certified as an instructor, there are great programs available like Fitness Vacation Exchange that will cover room and board for you and your guest(s) in exchange for 2 classes per day! While airfare isn’t covered, this can still be a great way to travel more affordably while experiencing different parts of the world. You may have heard great stories about people who have mastered selling on Amazon or Ebay. What you might not know is that using programs like Amazon FBA actually prevents you from having to have a house filled with stuff in order to do this. One family has been able to completely supplement their income and earn over $100,000 per year while selling on Amazon. They purchase products on sale or at a discount and then sell them on Amazon for whatever the current asking price is. In order to cut back on time, costs and “run around” time, they now work with Amazon FBA to ship their items directly to Amazon. That means they are no longer in charge of shipping or storage. Establishing yourself as an Amazon FBA expert is a great way to start earning a living for you and your family while traveling if you’re willing to put in the time. Take the FREE 7-day email course to learn more. I don’t know about you, but my travel agent is my best friend. Unfortunately, there was a decline in the use of travel agents due to all the capabilities of online booking. However, it can be hard to know who to trust in the digital world and travel agents are making a come back. Working with a travel agent allows people the one on one professional experience they seek when booking their trips. In order to give their best advice, travel agents are required to stay at resorts, go on excursions, and experience all the best places in order to best serve their clients. Because not much is required to become a travel agent, it’s possible to start right after high school and work right from a home office as well. If you’re looking for one of those jobs that let you travel, this one is definitely something to look into. Many people are beginning to see the benefits of opening their home or cabin as an AirBNB rental. Check AirBNB’s calculator to see how much you could be earning. Personally, our family has the potential to earn enough to literally pay for our monthly mortgage and we don’t live in a high demand location by any means. People who are able to rent out their home often find ways of doing it that allow them to travel at the same time. Having a lock box for keys and outsourcing the cleaning are small examples. If you have ever considered being an AirBNB host, check out all my best tips to be successful with it. Perhaps hosting an AirBNB doesn’t sound like an ideal way to travel. If that’s the case for you, maybe you’d be better suited for trying something like Home for Exchange where you can literally swap houses with people from locations all around the world. Just like the movie The Holiday (if you haven’t seen it…you should) you would be agreeing to literally swap houses with another person or family for a chosen period of time. This would allow both parties to take more affordable vacations without having to pay the cost of room and board. The one downfall here is that in order to exchange with people, you should have a home in high demand area. I personally don’t think anyone is wanting to take advantage of my tiny home in the Minneapolis suburbs. Transcription is a job that requires you to type different documents for people in varied professional fields. This job holds a special place in my heart because it is what my mom did my entire life in order to provide for me. She worked in the field of medical transcription and typed out doctor’s notes on patients. Back in the day it often allowed her to work from home using a word processing machine! –Crazy right? Because of her job we were actually one of the first people I knew to have a computer in our house. Nowadays transcriptionists have more freedom to travel and work from anywhere. To get the best training to begin this career, there are places online like Transcribe Anywhere that will equip you with the tools and information you need to begin working in this field. Because so many things are being done digitally these days there are so many opportunities to become a digital assistant. This could mean helping people run the social media aspects of their business, checking and answering emails or taking care of other necessary online tasks. Doing this frees up time for people or businesses to carry on with the bigger tasks of running their business while you are given the freedom to do most of your work from home or while traveling. There are many opportunities to work in the Peace Corp and not all of them are paid. However, if you have a passion for service and a desire to help others around the world, it would be wise to see all that the Peace Corp has to offer. Another great opportunity to do humanitarian work while traveling is through working with the International Committee of the Red Cross. There are a variety of opportunities for both resident (on location) and mobile (traveling.) To get more information, you can head to the job page on their website. While there are opportunities to teach English aboard, there are also many companies that are now allowing people to teach from their own homes on their own schedules. QKids – Degree may not be necessary if you have previous experience with children. SayABC – Earn up to $21 per hour and set your own hours. VIPKid – Bachelors degree required with potential to earn up to $22 per hour. These companies not only offer flexibility in work times and location but also provide curriculum and teaching materials so there is very little prep work needed on the part of the teachers themselves. Similar to blogging, vloggers are taking the digital world by storm through YouTube videos. If you are great with a camera, have fun on camera personality and know how to edit videos you could be well on your way toward earning an income through vlogging. See some of the different opportunities to make money through vlogging. If you have experience working with children you can easily become an au pair in different countries straight out of high school. Most opportunities require experience and a one-year commitment from you. Families will host you in their homes by providing room and board on top of pay (around $200 per week.) Requirements will vary from family to family, but you will get the chance to make sure you are paired with a family that fits with your personality and needs. This can be a great way to really experience the culture of a different country while making some money and getting hands-on childcare experience. To learn more check out the InterExchange website. Being a tour director means organizing, scheduling and planning tours for large groups of people. The International Tour Management Institute runs 2 week long sessions in order to help teach and prepare people on what to do. This just is perfect if you love traveling and enjoy teaching and inspiring others about local cultures and experiences. I’m sure we all know someone in direct sales or have tried it ourselves. People who claim they are living their best life because of the product they are selling. Is it really all that great? The truth is, it definitely can be if you are getting in with a company that you agree with and has great benefits. I used to do direct sales for about a year and was able to make an additional $500 or so per month just by sharing my experience and posting photos online. What does it take to really make it big in direct sales? Hustle and hard work. The same thing that works in every other area of your life. Many direct sales companies also allow for travel opportunities as incentives for selling. Before you jump in to make sure you research and fully support the company. If you support the product you’re selling, you are more likely to see major success. Becoming a writer is no easy task, but it can be very rewarding and allow for great travel opportunities. Freelance writing offers it’s own benefits in the sense that you may be able to work for multiple different companies writing articles or stories and getting paid to do it. Writers Work LLC is an all in one platform that will teach you how to find writing jobs, find clients and learn how much to charge. Many novel writers these days may start out as bloggers or other well known social media influencers. Building a following beforehand is a good way to ensure success with your writing. You can also begin promoting your writing on your own if you don’t yet have a book deal by creating your own! Here are some ideas on why self-publishing may be the best option for you and how to get started. No idea how to even start putting a book together? Try Blurb, a great company that allows people to create their own cookbooks, trade books, and even novels. Get 20% off your first order. Shoutout to my degree! Whoop! Graphic design can be a very rewarding job option for those who love the idea of working remotely with the option to travel. Many companies are looking for help with the design, layout, and management of their websites or other online platforms and this is generally a job graphic designers can do from anywhere in the world as long as they have an internet connection. Working on a cruise ship definitely requires a lot of work on your part, but there is also time for play and you will definitely get to see the world. Another great thing about working on a cruise ship is that it is possible to start in a lower level position on a cruise ship and work your way up! Here are some other facts about life on a cruise ship. If you have a passion for cooking and have a strong desire to travel then a food truck might be a great option for you! The downfall is, because of each states different rules and regulations, travel may be limited for a while. Still, the demand for food trucks continues to increase, but you have got to make sure you execute a well thought out food truck if you hope to see success. Read this article on 9 steps to start a successful food truck. Do you have a certain talent in outdoor sports that you could share with the world? Things like skiing instructors, scuba dive instructors, surf instructors etc are able to find employment around the globe. Even things like being a skiing instructor can allow for full-time work. You could be instructing in one country and as their winter comes to an end, it’s just beginning somewhere else. There are many ways to become a photographer that can allow for travel. In fact, my second cousin, Jim Brandenburg, started as a local newspaper photographer and eventually worked his way to National Geographic photographer and world known photographer. Because of this he has traveled all around the world and continues to this day. Wedding photography – Marketing yourself big time on social media can allow for a wider outreach. Many photographers are even willing to reduce prices (or scratch them completely) in exchange for the cost of travel. This is a great idea for destination weddings! Freelance work – Is there a need for photography at different events around the country? Let people know you’re willing to help them out! Selling online – Photographers can make a good living by establishing themselves as an expert in their field. This could mean selling photo packages, selling photos on sites like iStock or creating your own course to teach others the techniques of good photography or photo editing. No matter what you find to help you travel, there are tons of opportunities out there. Sometimes you just have to get a little bit creative! Did I miss something? Is there another awesome travel gig out there? If so, share in the comments below!